On they way to Cranfield village. Photo courtesy of Xiaojian Huang. 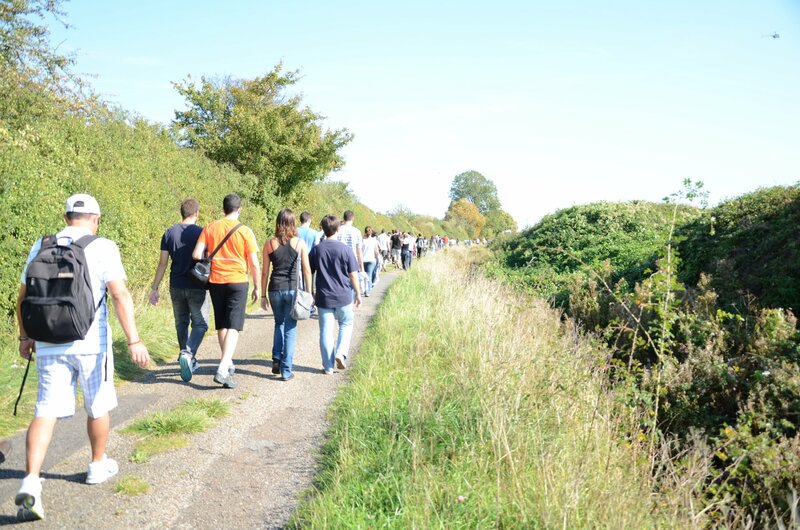 02 October 2011 – Our walk on Sunday afternoon aimed to introduce new students to the joy of walking to Cranfield village using a public footpath. This route is about 2.5 km one way and is a perfect running route, provided it is not too windy as it is quite exposed. This walk turned out to be a record-breaking event as more than 50 students attended! Luckily, we were prepared. Our group of experienced walkers covered front, middle and the back, namely: Eduardo, Graham, Periklis, Shiwei, Simon and myself. Once arriving at Cranfield village, we popped to Co-op supermarket and then had a short break, relaxing on the edge of the field, before embarking on the return journey. It was a peaceful walk except that our very long procession, spread out in its full length, did not escape the attention of Cranfield airport security staff. 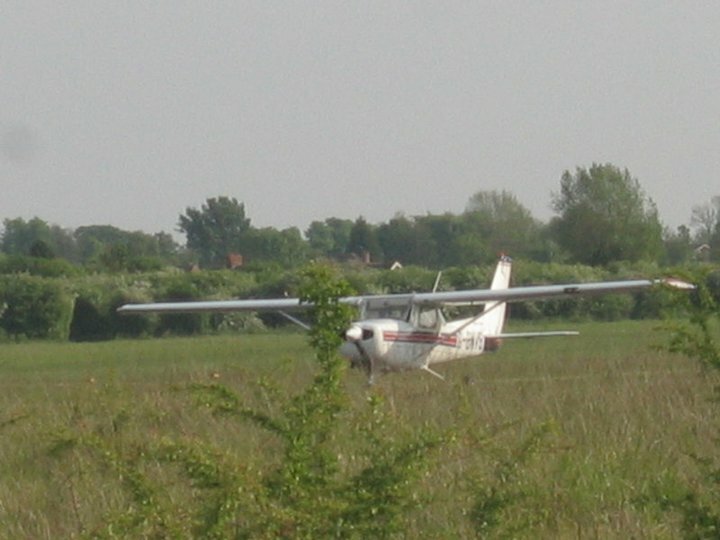 The footpath to Cranfield village follows boundaries of Cranfield Airport. Photo courtesy of Jeongha Ha. We were confronted by their marked vehicle, lights flashing, near the point where the path diverges. “We are going to a tea party,” I replied innocently to the security man’s question; what was this all about? Which was true, we were on the way to join a tea party at Mitchell Hall, organised by the Community Centre. Our activity looked apparently suspicious – I guess, they have not seen so many people before using this public footpath at once. It was then suggested to us to follow the path religiously, which would mean going over the stiles. I had to refuse this suggestion politely as with such a large group, it was much easier (and safer) to use another option – a nice wide path that follows the hedge round the corner. 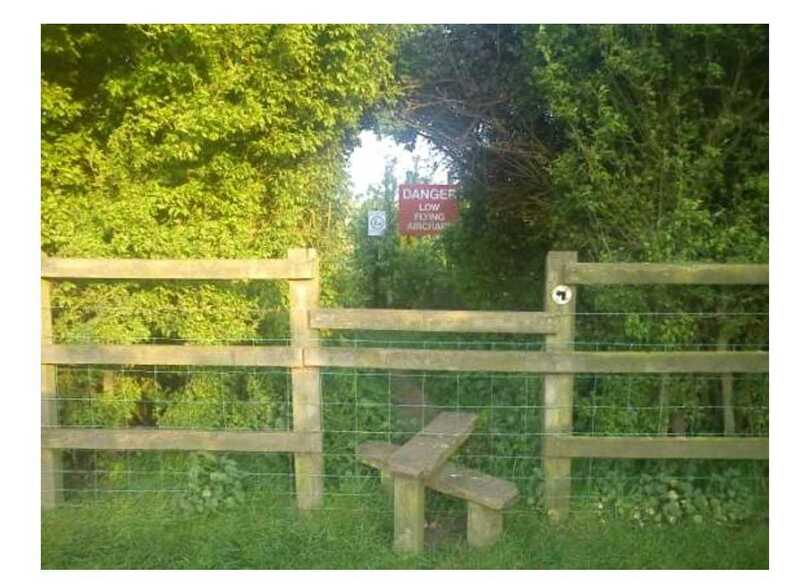 This section is regularly used by runners and thus makes the walk to Cranfield village stiles-free – however this is an unofficial section of the public footpath that is not marked on Ordnance Surveymaps. We were let off on this occasion to continue on our planned route back but advised to seek an official permission from the university to use this unofficial small stretch of path in the future. Oh, no, not again – wouldn’t even know who to ask. Probably not Transport Team as they don’t feel strongly about walking falling into their department. Anyway, we had a lovely walk and did manage to get back to the tea party well ahead of time. Location of the two stiles on the footpath. Alternative sections of route are shown as dash line. One of the two stiles en route to Cranfield village. 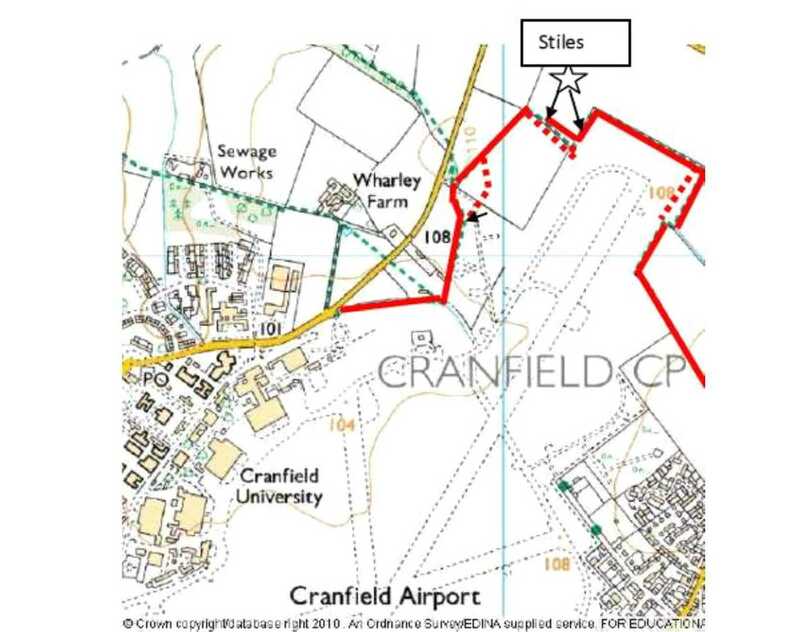 This entry was posted in Blog, Walks and tagged airport security, Cranfield University, Cranfield village, walking, walks.